Bryant’s Matt Albanese (above) won the 2014 NEC Rookie of the Year award after leading the circuit in doubles and runs scored. Bryant went 3-0 last week and sophomore Matt Albanese went deep in all three contests. Belting four homers in 10 at-bats and slugging 1.600, Albanese’s individual performance landed Bryant’s centerfielder on the Louisville Slugger National Player of the Week list. Albanese was one of two non-pitchers to earn Collegiate Baseball News’ weekly honor, joining South Florida first baseman Buddy Putnam. Albanese became the second Bulldog to earn a Louisville Slugger National Player of the Week honor since the program joined the NEC in 2009. Kevin Brown, the 2013 NEC Player of the Year and a MLB Draft pick, won the award as a senior. All four of Albanese’s hits came in the form of home runs last week. 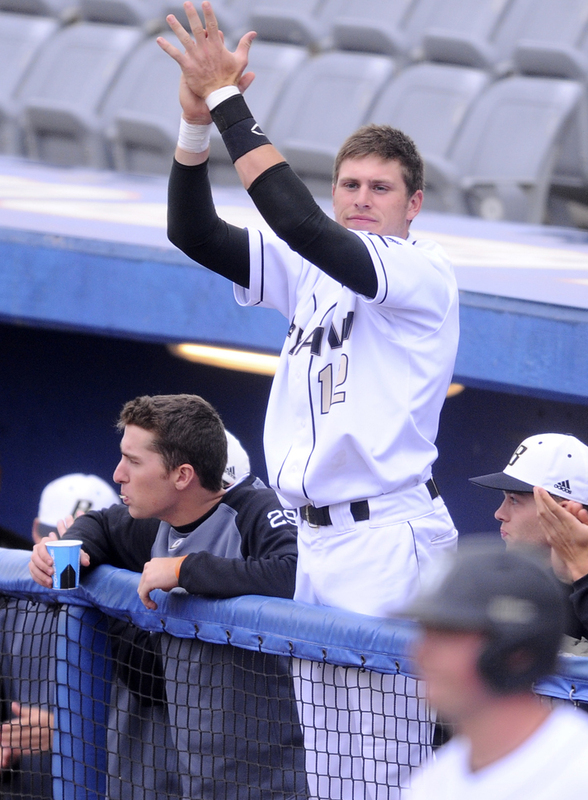 The sophomore outfielder went deep in each of Bryant’s three victories en-route to a 1.600 slugging percentage. Compiling a .500 on-base percentage, Albanese did not strike out in any of the three games. He batted .400 with eight RBI, four runs scored, one walk and one HBP. Albanese homered twice during Bryant’s 7-6 comeback victory over UMass Lowell. The second-year Bulldog led off the fourth inning by blasting a solo shot and his two-run bomb in the seventh frame cut Bryant’s deficit to 6-5. Albanese provided the only runs starting pitcher Kyle Wilcox would need in a 3-0 win over Hartford. He launched a three-run bomb to left-centerfield to break a scoreless tie in the first half of Sunday’s double dip with the Hawks. In the nightcap, a 3-2 victory, Albanese’s two-run shot down the leftfield line pulled Bryant even at 2-2. The #NECselfie contest is down to the final stage and an all-St. Francis Brooklyn championship round awaits. Top-seeded @gabbspinn overcame a wide deficit in the final hours of the semifinal round, edging No. 4 seed @toriiigee, 51.2 percent to 48.8 percent, for a berth in the title tilt. Meanwhile, No. 6 seed @harryodell6’s Cinderella run continued. @harryodell6, who earned one of the two at-large berths in the 8-selfie championship bracket, came from behind to top No. 7 seed @UncleJesseN, 52.1 percent to 47.9 percent. Championship Round Fan Voting will unfold on Friday, March 27. The polls will be open from 9:00 am until 9:00 pm ET. The No. 2 and No. 3 seeds suffered opening round exits in our #NECselfie Tournament. The result is a “final four” matchup between No. 6 @harryodell6 and No. 7 @UncleJesseN. Meanwhile, top-seeded @gabbspinn will face No. 4 @toriiigee in the other semifinal matchup. Both women won their quarterfinal contests rather handily. Semifinal round fan voting will be open from 9:00 am until 9:00 pm ET on Wednesday, March 25. Vote for the top game faces below. Quarterfinal round voting will be open from 9:00 am until 9:00 pm ET on Monday, March 23. The four head-to-head winners will advance to the semifinal round voting, which will be held on Wednesday, March 25. The #NECselfie championship round vote will happen on Friday, March 27.